For years, Breaking Bad was THE series to watch. It was gaining awards left, right and centre, and had everybody talking about Walter White, Jesse Pinkman and their blue meth. However, it wasn’t until a couple of months ago that I joined the Breaking Bad party, gave in to pressure and started watching the critically acclaimed series. Having started watching Breaking Bad well after the series had finished, it was always difficult to avoid spoilers. One mention of the fact I had started watching it and I got “Ooooooh! Have you rather the part where…?”. I usually answered this with a very loud “SHHHHHH!” before they’d even finished the question. I thought avoiding spoilers online would be the difficult part but I suppose being a few years late meant that the hype had died down and everyone had moved onto talking about other things (Game of Thrones, the next big series for me to tackle!). For those of you who don’t know (although I’m guessing that’s a very, very small minority! ), Breaking Bad follows the story of Walter White (Bryan Cranston), a high school chemistry teacher who is diagnosed with lung cancer. With a baby on the way, and a disabled son, Walt and his wife Skyler are struggling financially. 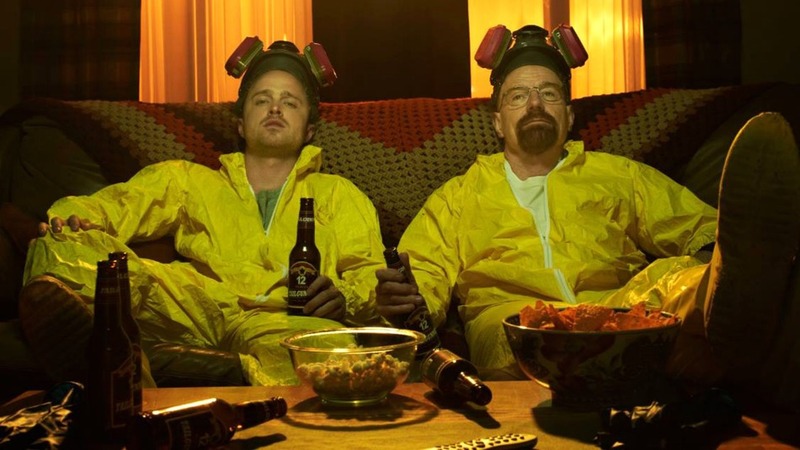 To make sure he can pay for treatment, and have enough money for his family to survive on should he die, Walt turns his hand to making meth alongside ex-student Jesse Pinkman (Aaron Paul). 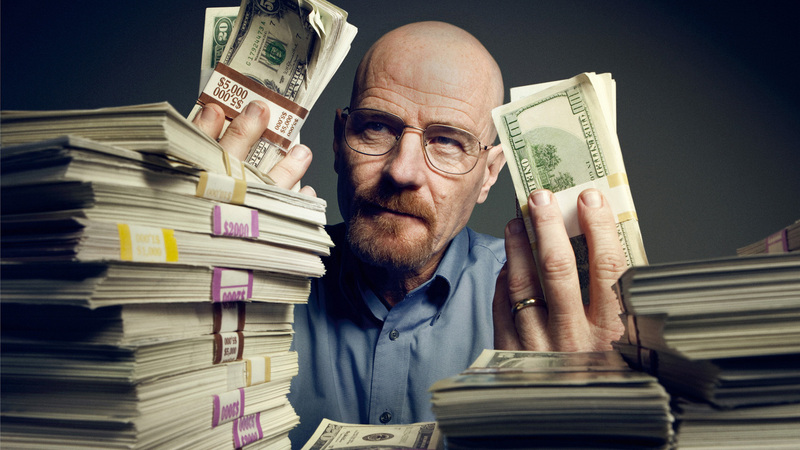 Breaking Bad is one of those shows that once you start, you simply can’t stop. From the very first episode, you’re drawn in, watching Walter change from a haphazard, family man to a ruthless criminal mastermind with a taste for blood. There is no wonder why Bryan Cranston was showered in awards for his role. The subtle changes across the series, which turn Walter from a likeable, sympathetic character to one that you’re hoping will be caught by the police is impressive. Considering Cranston is perhaps better known for comedic roles such as Hal in Malcolm in the Middle, his portrayal of Walter White shows his true acting talent. While there are many jokes that Bryan Cranston could simply sneeze and be awarded an Emmy, I don’t think they’re far off! Aaron Paul was relatively unknown at the beginning of Breaking Bad, having only appeared in small bit parts. Breaking Bad changed all that. Having started off almost as a comic relief, Jesse becomes a character that you can’t help but love. Introduced as a drug dealing junkie, Jesse soon becomes the most likeable character in the series. He may not be the most intelligent of characters, but he thinks on his feet and often comes up with simple solutions to problems when Walt over thinks things. By the end of the five seasons, all I hoped for was a happy resolution to Jesse’s story. While I was hoping for some sort of retribution for Walt, all I wanted for Jesse was redemption. It was quite clear from early seasons that Jesse had a kind heart, regularly helping children who were innocent parties to the illegal activities they were involved in and therefore, I felt, deserved a positive ending to his story. The associated cast was also highly commendable. The likes of Skyler (Anna Gunn), Hank (Dean Norris), Marie (Betsy Brandt), Saul (Bob Odenkirk) and Gus (Giancarlo Esposito) really made the series, and all were key to Walt’s story. Not only is the story interesting and engaging the whole way through, it’s also beautifully shot. Set in Albuquerque, New Mexico, the majority of the series is shot in desert locations, and the cinematography helps to create the hot, sticky feeling like you’re out in the desert sun with Walt and Jesse. The range of shots used, including point of view shots from inanimate objects helps to break up the standard medium shots that we’re used to in television series. My only criticism of the series is its drop off in humour. While it’s understandable as the story line became increasingly darker as the series went on, I often found episodes rather dark and heavy – the episode where Gus was wielding a box cutter, for example – meaning that I had to leave a gap of a few days or weeks before moving onto the next episode. Many people I’ve spoken to found the first series difficult to get into. While I felt the same, once I’d made progression through the first few episodes, I was hooked. Even if you only have a mild, passing interest in the series, give it a go and you’ll quickly see why everyone was talking about Breaking Bad. Next step – Better Call Saul! Breaking Bad seasons 1 to 5 are available on Netflix.